I started using the Internet in the early 1990′s with a dial-up modem and a bulletin board system. They had Usenet there and I quickly discovered rec.music.dylan, the first music Usenet group. Suddenly I could easily communicate with kindred spirits all over the world who also knew about Bob Dylan and loved his music. This changed my life for the better and it soon led to my being asked to develop a bibliography of books by and about Bob Dylan. That sounded easy enough. I figured it might be fifty books or so. No one told me what format I should use. That was up to me. Tim Berners-Lee (now Sir Tim . . . ) had recently invented the World Wide Web and somehow I learned that the key to all the cool linking was HTML. One day in Fry’s, I came across Laura Lemay’s book, Teach Yourself Web Publishing with HTML 3.2. I leafed through it. It didn’t look hard at all, and soon I decided this would be the format I would use for my Dylan bibliography. I typed the whole thing into a simple text editor, adding the tags from Lemay’s book and finished up the first version sometime in 1995. Mind you, I was earning my living as a pretty darn good tax accountant, a career I started in 1976, doing bookkeeping using input sheets and an external service bureau at first, but then with an Apple II+ by mid 1977 or so. Bob Dylan’s music was a strong interest of mine, but I was not a computer programmer, though I had some friends with such skills. I did the whole bibliography on my own by following the instructions in that book. It was easy, but pretty time consuming, as there were far more than fifty books to compile, about ten times that many at first, then twenty times the fifty, and even more now. This experience was super empowering to me. It gave me a lot of hope for the future of information. By being a fairly adept computer user, I could gather this huge pile of information, organize it in a good way and make it available to anyone in the world with access to the web. Which is what I did. I had to pay Netcom that had the server that held my hundreds of text files, but otherwise, I was totally on my own to put whatever I wanted into it. I freely provided the information to the world and especially the Dylan community. This was years before Bob Dylan or any other musicians had their own official websites. It was also before Google, Facebook or Twitter even existed and before the Internet was a platform for making money. The computer meaning of the word “silo” had not yet been invented. My website is still there, like a relic of times past. Wikipedia has a page listing websites founded before 1995. It’s not a very long list, though surely not comprehensive. My site was first published the next year and it’s still there where I put it. One article in 2015 said that the average lifespan for webpages is something like 100 days. In the late 1990′s the typical webpage lasted for around 44 days. I kept my website up because even though Bob Dylan was not awarded the Nobel Prize for Literature for more than another twenty years, I knew, even back then, that his life work was important to our culture and was worth preserving. Soon Google will begin to warn visitors to my site that it might be dangerous and folks would be smart to hit the back button in their browsers and avoid it. 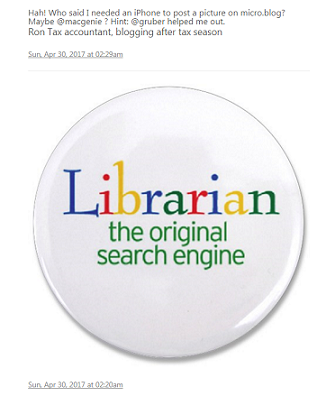 Again, when I first published, “googling” something was not even a word. The most powerful search engine in those days was Alta Vista, a name which I always thought had a nice ring to it. But now the giant Google acts like it is the King of the Internet, rather than Amit Kataria, making the rules for us to follow. My website is an HTTP site and always has been. Now Google doesn’t like that, but Laura Lemay didn’t teach me a thing about HTTPS and didn’t warn me how dangerous my handiwork might be. As far as I know, in the 23 years my website has been there, it has not caused any harm to any computer, computer network or computer user on the planet. None, nada. It simply hands out accurate infomation about books, when people request the information with their web browsers. I’m pretty sure that’s what Berners-Lee had in mind when he invented the web. It is a totally static accumulation of text files. Probably 95% of the links I created still work, because they are all internal links, pointing from one page in the bibliography to another. I did it that way on purpose, because I wanted it to last. 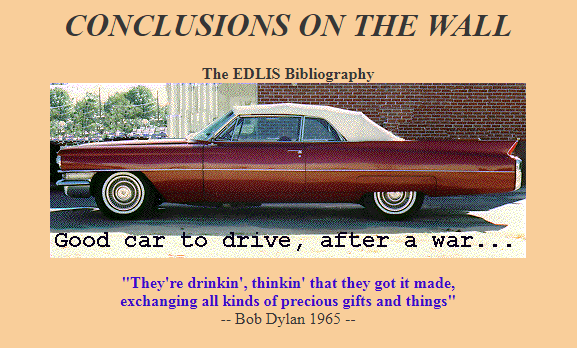 Near the end of my work on it, I added ONE page with external links to other Dylan related websites. Many of those are now dead links. I have not bothered to update that one page over the years and it does not even have a link to Dylan’s official website, because bobdylan.com didn’t exist when I first created the page with the external links. The only thing you can do at my website is read about Dylan books. There is no discussion area, no place to leave comments, no books for sale, not even a proprietor at home to answer a knock on the front door. In fact there is not even a front door! There are no user accounts in the website. I can log in to my account at the hosting service, though I haven’t done it in many years. It might be considered a useless relic of the past by some, perhaps some might even think it has been abandoned. But it has not been, because it contains information on 544 Dylan books and many of these books are being read every year by people interested in the subject. Was Goggle elected by Congress or some international body as the arbiter of what is permitted on the Internet? Probably not. When I first learned about this plan to begin to warn people about the dangers of my website, I naturally did a Google search and found a lot of pages with very technical discussions on Internet protocols, full of Internet lingo way beyond what Laura Lemay had taught me about. Back then it had been easy. Now it has obviously become super complicated, a huge industry where tons of people make a very good living creating the Web, and outsiders like me are excluded a voice. And in recent years, I also learned that the free Gmail account that Google so generously provided to me was actually a tool they could use to sell information about me to advertisers. I have never tried to make any money from my website, but Google wasn’t sitting around being altruistic. They were out making gigantic annual profits, some of it stemming from information in my emails. I no longer blindly trust their actions as being in the best interests of the Internet or our culture. I still don’t understand how my website has become so dangerous. I have recently searched for simple language that will explain the danger it is creating, but without success. There doesn’t seem to be anyone who actually cares whether I understand about this or not. The world and the Internet have moved on. Now big businesses use it to generate billions of dollars of income each year. The technical people who make this possible enjoy big paychecks and communicate among themselves with their own special language and technical jargon that puts them among the elite, an unelected ruling class in our culture today. I’m not a part of that elite class of people. But you know what, I still have the best website with a Bob Dylan bibliography, even though it is now two decades out of date. Many of the books there are still important books on the subject, even though there are also tons of other important books on the subject that have come out since May 1999, the end of my active work on that website. One day I will publish a much more comprehensive bibliography. And maybe I should encrypt it, so no one can read it. Google’s new attacks on HTTP came up recently on Micro.blog, mostly a criticism of Dave Winer who has spoken out against this program Google has engaged upon. Dave has always seen the Internet as an opportunity for many voices. Years ago he even dreamed about making it possible for poets to set up their own servers and write anything they wanted to write. In his companion podcast, he said, “It’s time to stop thinking about these servers as being things for geeks, and start thinking about them for people with ideas.” And he’s still talking about wanting to make it “easier and easier for people to run their own web servers.” That’s what I did in 1995 with the help of Laura Lemay. But the Internet is now a platform for the super nerds, except in the silos like Twitter and Facebook, which is why they are so popular with regular folks. This is the truth. As Dave points out, the technically elite who support this Google plan, talk about how it’s really easy and inexpensive to convert an HTTP site to HTTPS site. One user on Micro.blog wrote, “I have a few domains. They all terminate in the exact same Caddy instance, which uses vhosts.” He went on to say that Dave could easily convert all his domains to HTTPS. All he would need to do would be “to copy & paste a 10-line config for each domain in order to put Nginx or Caddy in front of it.” See, really easy! But for me, I have no idea what a Caddy, vhost or Nginx is. Should I Google them and learn all about them? How many hours would it take me to learn what those words mean and what they have to do with the danger caused by my 23 year old static website? Didn’t I do enough in the hundreds of hours I spent compiling and formatting the information for my Dylan bibliography? “Easy” for me would mean going to a website, entering the URL to my website and clicking a button that says Convert to HTTPS. Period. If it’s not easy like that, then it’s not what I call easy! Should I dismantle my Dylan bibliography because it is so dangerous? No, I won’t do that, because there is still no one who has explained to me what is so dangerous about it, or shown me any damage it has caused. Basically, I don’t believe that it’s the least bit dangerous. If it really IS that dangerous, then maybe some of the technically elite should have fixed this flaw in the Internet decades ago. They can contact me as soon as they have finished creating that Convert to HTTPS button, if they want me to change it. In the meantime, they can get off Dave Winer’s back, who has been speaking out for regular folks and working to make it possible for them to be able to freely and easily publish their ideas on the Internet for decades. The garage in the house we’re buying is just under 17 1/2 feet deep. Sadly that pretty much rules out some cars, as we want to keep our cars in the garage, with the door closed. The following cars would stick out the back, making it impossible to close the door. So they have been taken off the shopping list. 2017 Audi A8L Extended, 20 feet, 10 inches long (over three feet t0o long). 1977-1984 Fleetwood Limo, 20 feet long (nearly three feet too long). 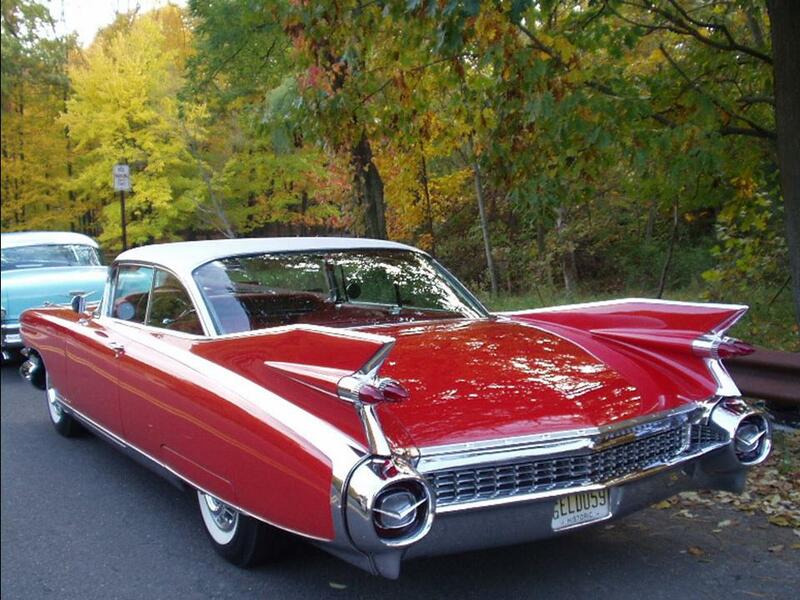 1959 Eldorado Seville, 18 feet, 9 inches (the whole fin would be outside). 2016 Vision Mercedes-Maybach 6, 18 feet, 8 inches (more than a foot too long). Ford Model T - Keep this one on the shopping list! 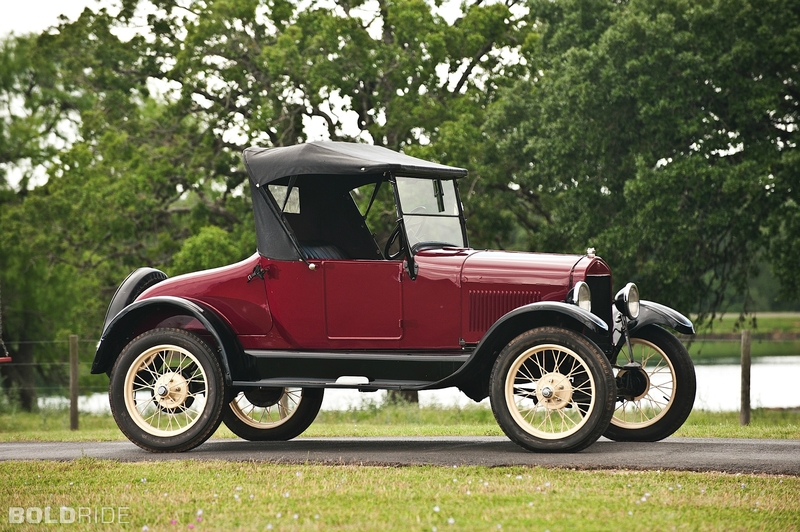 The 1926 Model T Roadster would fit nicely in the garage with more than five feet to spare. In fact, that might have been the original car at the house! In the first few days of my being on Microbog, I noticed people posting images, so I asked how I could do that. The answer was, “Use the app.” I found out they meant I should use the Microblog app on the iPhone, which apparently made it easy to post a picture. This was when I first discovered that Microblog is written by Apple users, its technology mainly focused on using Apple devices for posting on Microblog. I hadn’t noticed this restriction when I signed up for the Kickstarter for Microblog. But there is a web interface for Microblog, so surely there must be a way I could post a picture using that. No, I was told there wasn’t, not yet. But I found it could be done, using markdown and my Dropbox Public folder. The images had to be in that particular folder, a type of folder that Dropbox was no longer including with Dropbox accounts. By logging in to Dropbox, I could navigate to that folder and I could then get a public link for any image there. If I used that link in the URL of the image syntax in markdown, the picture would appear on Microblog, when posted. I was thrilled that I had figured out how to get a picture to post. Here is the first picture I posted and when I saw it worked, I posted a text message, needling the user who told me I would need an iPhone for posting pictures. The next day, I posted my favorite image of my car. 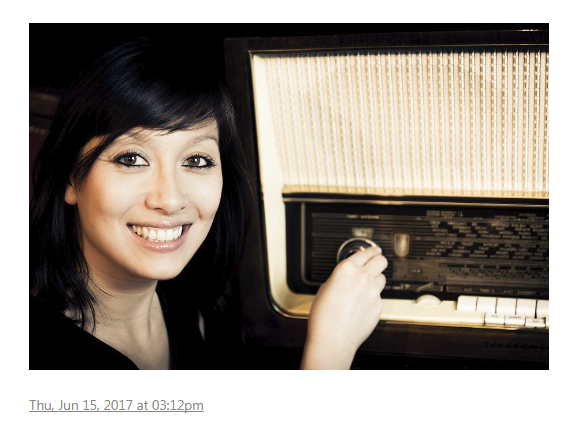 And on June 15, 2017 I posted my favorite picture of Nina Widjaja posing with a Telefunken Concerto radio. 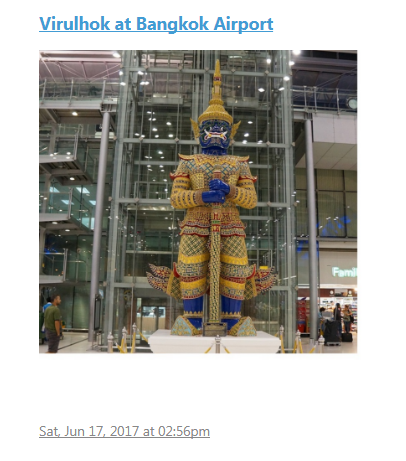 A couple of days later I posted a picture from Bangkok Airport, but it gave a very unsatisfying result, ugly really. I discussed the issue with Manton and then never tried to post another image again on Microblog. Until today, that is. I had received an email from Dropbox, informing me that my “Public folder links will become inactive on September 1.” Once again an Internet service was changing the rules on me. They said if I “want to shares those files again, you’ll need to use shared links instead. I read the instructions and tried it on Microblog. The picture I was trying to post came out blank, above where I posted a title for the picture. On my About page, it showed the text “Before Dylan Show” where the picture belonged. 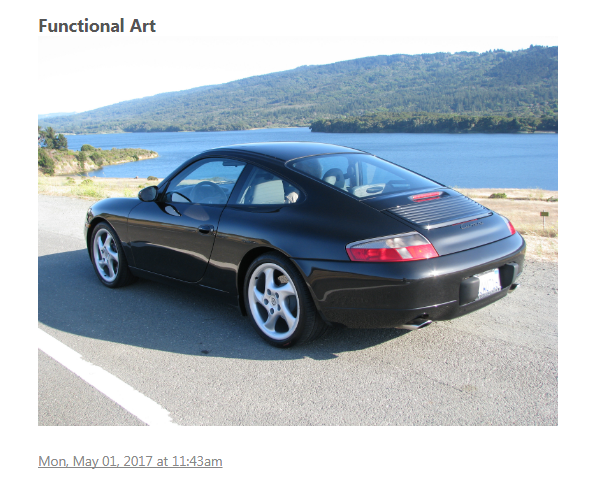 In the Home stream, the area for the image was just completely blank. Here’s the picture I was trying to post. Works okay here, doesn’t it. So it looks like beginning in September, I will no longer have the ability to post pictures on Microblog. I guess it isn’t a huge loss. I had stopped posting images there, even using my Dropbox trick, because the result was so ugly with my Virulhok photo. And Blot seems to do a great job in posting pictures, so I guess I’ll just use Blot for images. A few years ago, I was collecting all the Sandy Denny albums I could get my hands on. She died at the very young age of 31 in April 1978, as a result of complications from a fall down a staircase, hitting her head on concrete. When I was collecting her albums, I don’t remember ever seeing any videos of her performing. That changed yesterday when I found this 1970 video of her performing four songs, including John the Gun, one of my favorites. I’ve been working my way through the various features of Blot, taking Baby Steps, and having a pretty easy time of it. After it was so easy to get pictures working, I took another look at the Blot help page to see what I might take on next. Two things jumped out at me: footnotes and tags. I couldn’t think of a reason I might need to use a footnote, but a recent experience had brought them to my attention. 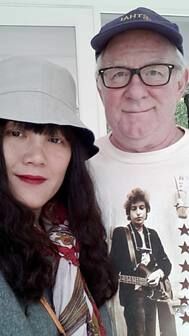 I had come upon a scholarly article by Steven Rings at the University of Chicago about one of my favorite Bob Dylan songs, “It’s Alright, Ma (I’m Only Bleeding).” And I do mean scholarly! The pdf file of the text has 39 pages. with another pdf file of 27 pages which has the examples. It has an Abstract, a Table of Contents, an Introduction, many pages of discussion, a Bibliography, a Discography and 102 Footnotes. I was last reading scholarly papers in grad school at UC Berkeley, a loooooong time ago. This thing has the whole nine yards, verrrrry impressive. The footnotes impressed me with the sheer brilliance of their execution on the web page. Each numbered footnote has a footnote number in parentheses, elevated a bit at the end of the relevant line in the text. Hover over that number and you can read the text of the footnote in a popup window. Click on the number and you jump to that footnote in the Footnotes section at the bottom. And just below that is a link labeled, “Return to text.” Click on that and you’re right back to the text you were reading when you clicked on the footnote number. I had NEVER seen that on a web page and I was very impressed. So when I saw Footnotes in the Formatting blog posts section of the Blot help pages, I focused in a bit in my reading. The Blot instructions had a title and four lines of text. That was it. So it was a candidate I put on my list for possible future experiments. I tried to think of an article I could write that would need footnotes, but I couldn’t think of one. And then one fell into my lap! There had been a bit of a discussion of my article about Location (Where Are You From?) on Microblog and I decided to edit the original article to add that discussion as an Update. As I did that, the opportunity for a footnote, even the necessity for a footnote jumped out at me. I went back and read the four lines of Blot instructions about footnotes and gave it a try. It worked beautifully immediately, first try. Take a look at the updated article. Okay, it doesn’t have the popup window for reading the footnote. But clicking on the footnote number does take you to the footnote at the bottom. AND look at the tiny little arrow to the right of the image at the bottom. Click on it! It takes you back up to the text where you clicked on the number 1 for that footnote. I nearly fell over. Four lines of instruction, easily implemented and I get that? WOW! Blot continues to amaze me with its simple implementation and the clean, clear formatting that results. I am very pleased that I decided to give this thing a try. I received no compensation of any kind for this endorsement. I’m just a happy camper. I searched Google for “Best blogging software” and got sixteen results on the first page with lots of articles comparing five to eighteen platforms, all the usual suspects and none mentioned Blot. In fact Blot doesn’t seem to even be on the radar, except for one site from a domain name seller. But that’s fine with me. I’m having a great time with both Blot and Manton’s Microblog (also not mentioned in these results) and I used a lot of Dave Winer’s many tools for the last several years. I don’t even remember how I found Blot, probably from someone on Microblog, maybe Jack Baty, who always seems to be on the bleeding edge of technology. Did I mention that I don’t have to pay for any server in the cloud with Blot and my data is all in my own Dropbox folder?